A Walt Disney World vacation is the perfect holiday gift for loved ones to create memories that last a lifetime. You can cross another holiday present off their list and save up to 25% on rooms at select Disney Resort hotels for stays most nights January 1 through April 27, 2019. With so many unique and exciting things to discover at all 4 theme parks in the new year—NOW is the best time to book your 2019 getaway. When you add valid theme park admission to this room offer, you’ll be able to play big in Toy Story Land at Disney’s Hollywood Studios, soak up a variety of new, limited-time experiences at Magic Kingdom park and explore the ultimate celebration of food, art and entertainment at the Epcot International Festival of the Arts. Offer ends on January 2, 2019. Please contact us for more information or to book one of these amazing Walt Disney World Vacations. When Toy Story Land opens in Summer 2018 at Disney’s Hollywood Studios®, guests will shrink to the size of a toy and explore all of the fun (and toys!) Andy has constructed in his backyard. This story continues at Woody’s Lunch Box, where Andy has used his lunch box and thermos to create a walk-up quick-service window that will serve up tasty meals and old-fashioned soda floats. In the rendering above, you can see that Woody’s Lunch Box – like the rest of Toy Story Land – has been adorably strewn about with some of Andy’s favorite toys and items from his lunch. Guests can even spot a green army man on a nearby lookout tower, keeping watch for Andy’s return. The Walt Disney World® Resort will partner with Mini Babybel to bring this location to life. Stay tuned for more information on Woody’s Lunch Box – and the menu of delicious items it will serve up – in the coming months. Walt Disney World Resort continues to monitor the path of Hurricane Irma as they take the necessary steps to maintain the safety of Guests and Cast Members. Please visit Walt Disney World > Frequently Asked Questions > General Questions to view the Hurricane Policy for Walt Disney World Resort. Disney’s Blizzard Beach water park will be closed Friday, September 8 and Saturday, September 9. Disney’s Typhoon Lagoon water park will remain open for Guests during this time. Disney’s Fort Wilderness Resort & Campground will be closed beginning Saturday, September 9 at 2:00 PM. In anticipation of inclement weather associated with Hurricane Irma, please note the following event cancellations at Walt Disney World Resort. Night of Joy at ESPN Wide World of Sports Complex has been canceled on Saturday, September 9, 2017. The performances on Friday, September 8 will take place as planned. Guests with tickets for Saturday are welcome to attend Friday’s event instead by exchanging their tickets at the ESPN Wide World of Sports Box Office after 4 PM Friday. Requests for a full refund for either event night will be honored. To redeem these offers, Guests should call (407) 939-7818 by January 31, 2018 between the hours of 7:00 AM and 11:00 PM., or email us at Ticket.Inquiries@DisneyWorld.com. Please have your tickets available so we may process your request for you as quickly as possible. Guests under 18 years of age must have parent or guardian permission to call. Muppets Courtyard, along with a portion of the former Streets of America, is being re-imagined by Walt Disney Imagineering to become a new area called Grand Avenue. Inspired by the revitalization and the vibrant culture of present-day downtown Los Angeles, Grand Avenue is where vintage office buildings and warehouses are being converted to exciting new uses. You will soon see facades for “merchants” appearing in this area for a music shop, loft apartments, a tailor and more, with each window on the street featuring charming displays. A highlight of Grand Avenue is sure to be BaseLine Tap House, which takes over a former F&B location. This new corner pub will feature California beers and wines along with a selection of small bites. (Read more on BaseLine Tap House in this post by Pam Brandon). The current Muppets Courtyard will become Grand Park, an urban square off Grand Avenue surrounded by shops and restaurants like PizzeRizzo and Mama Melrose’s Ristorante Italiano. You can already see changes in the area, with the Muppets theater being renamed “Grand Arts Theatre” and boasting a brand-new marquee. But, not to worry – Kermit, Miss Piggy and the gang continue to star in their hilarious and irreverent “Muppet*Vision 3D” show. Grand Avenue will be opening to Guests this fall. Walt Disney World® Resort roadways just got a little more fun, with the launch of a new transportation pilot called Minnie Van service. Announced earlier this month at D23 Expo 2017, this new transportation service is now available to guests staying at Disney’s BoardWalk Resort and Disney’s Yacht & Beach Club Resorts. Through a collaboration with the US’ fastest growing rideshare service, Lyft, guests at these resorts can arrange their own private Disney vehicle right from the Lyft app on their smartphone. With Minnie Van service, Disney Cast Members will then whisk them away to wherever they want to be at Walt Disney World Resort. This service accommodates up to six Guests and provides two versatile car seats so even the tiniest of passengers can travel in style! Minnie Van service will be available between 6:30 a.m. and 12:30 a.m. (subject to change). Guests staying at Disney’s BoardWalk Resort and Disney’s Yacht & Beach Club Resorts can learn more by visiting their Bell Services desk. With Magic Shots from Disney PhotoPass Service, you can transform their photos into unique keepsakes as you recreate a favorite movie moment, enjoy your vacation with a Disney Character, or react to a fun surprise. All you need is a little imagination – and a PhotoPass photographer! Whether you want to take numerous Magic Shots or just a favorite, there’s a new way to locate these photo opportunities. PhotoPass now has one place where you and your family can discover which Magic Shots are currently available within each of the four theme parks at Walt Disney World® Resort. To check it out, head over to the Disney PhotoPass Service Facebook page, navigate to the Photos tab, and then to the Albums. There’s now a photo album showing each park’s current Magic Shot offerings and where they can typically be found. The information will be continuously updated as Magic Shot offerings adjust and expand (especially around festivals and holidays! ), so be sure to check it out right before your Clients visit to Walt Disney World Resort so you can share latest information about availability. Magic Shots are included as part of an active Memory Maker entitlement. Please note that Magic Shot offerings are subject to change and photographer availability. BB-8 to Meet Guests at Disney’s Hollywood Studios! Have you ever wanted to meet BB-8 the droid from Star Wars: Force Awakens? Well starting this spring at Disney’s Hollywood Studios at the Walt Disney World Resort guests will have the opportunity to meet the famous droid. He will be meeting guests in the parks Star Wars Launch Bay. BB-8 will appear in addition to Kylo Ren (or Darth Vader) and Chewbacca, the characters from the Star Wars galaxy who guests can regularly encounter at Star Wars Launch Bay. For more than a year, Disney’s Animal Kingdom® Theme Park at Walt Disney World® Resort has continued its evolution to a day-to-night park by introducing a rich variety of new nighttime experiences – from Kilimanjaro Safaris after sunset and fine dining at Tiffins, to the vibrant entertainment at the Harambe Wildlife Parti and Discovery Island Carnivale. And when the Tree of Life awakens after dark, it is truly a sight to behold! Today, Disney’s happy to announce one of the park’s newest nighttime experiences, “Rivers of Light,” will make its official debut on Feb 17, 2017. 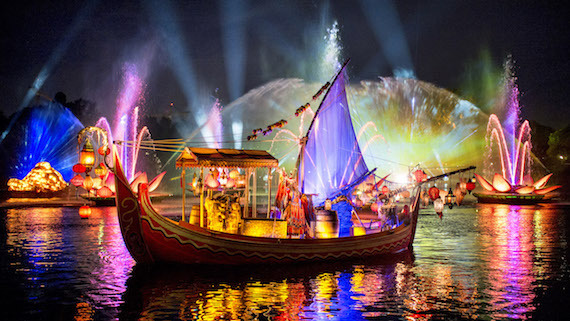 Continuing the grand Disney tradition of innovative, after-dark entertainment, “Rivers of Light” combines live performance, floating set pieces, a soaring musical score, fountains and more in a celebration of animals and nature. The story magically unfolds on the broad natural stage of the Discovery River, conveying the uplifting spirit of an ancient and timeless lantern ceremony and filled with symbolism, storytelling and plenty of heart. This new show will also be part of the Disney Dining and FastPass+ reservations. The park’s culinary team has been working hard to create special dining packages at both Tiffins and Tusker House Restaurant to add to the special evening. Similar to the popular “Fantasmic!” Dining Packages at Disney’s Hollywood Studios®, the “Rivers of Light” Dining Package includes reserved seating at the new show. At all-you-care-to-eat Tusker House, guests can choose the breakfast, lunch or dinner buffet on the day of the show (but they will have to dine at least 2 ½ hours before the show). Breakfast is $37, $23 ages 3 to 9, plus tax and gratuity; lunch and dinner, $49, $30 ages 3 to 9, plus tax and gratuity. Tusker House Restaurant is on the Disney Dining Plan and counts as one table-service meal. At Tiffins, “Rivers of Light” Dining Packages are available at both lunch and dinner. Guests can choose their favorite appetizer, entrée, dessert plus a non-alcoholic beverage. Dining must take place at least two and a half hours prior to showtime. Cost is $67, $32 ages 3 to 9 plus tax and gratuity. Tiffins accepts the Disney Dining Plan, and counts as two table-service meal entitlements. Pandora – The World of Avatar Opens May 27, Star Wars-Themed Lands Set to Open in 2019 and more! Today Disney is excited to share that Pandora – The World of Avatar will open at Disney’s Animal Kingdom® Park at Walt Disney World® Resort on May 27, 2017. This new land will transport guests to the visually stunning world of Pandora. Here, they will wonder at floating mountains and bioluminescent plants, and can join the Na’vi on two excursions that take adventure to the next level. First, the family friendly Na’vi River Journey will send guests through a bioluminescent rainforest. Their journey will end in an unforgettable encounter with a Na’vi Shaman, a figure who has a deep connection to the life force of Pandora. And second, Avatar Flight of Passage will offer guests the jaw-dropping experience of exploring the world of Pandora atop a Banshee. Guests will also be able to dine at Satu’li Canteen, grab a drink at Pongu Pongu or shop for Na’vi cultural items, toys, science kits, and more at Windtraders. Also, Disney is excited to announce that their new Star Wars-themed lands at Disneyland® Park in California and Disney’s Hollywood Studios® in Florida will be opening in 2019! The Star Wars-themed lands are the largest-ever, single-themed land expansions at Disneyland® and Walt Disney World® Resorts. At each location, guests will be transported to a never-before-seen planet – a remote trading port and one of the last stops before wild space – where Star Wars characters and their stories come to life. Here’s a glimpse at one of the signature attractions which lets guests take the controls of the Millennium Falcon! This unique, new character breakfast is slated to begin in late spring. Jack Skellington Joins Mickey’s Very Merry Christmas Party as "Sandy Claws"